The increased economic pressure and the rapid technological development have seriously affected the world of work; the working conditions have undergone significant change resulting in increased exposure of workers to dangerous substances. Fundamental research in nanoscience encompasses a wide area of uncertainties and concerns. Employers, workers and their representatives need to know about the risks to workers’ health in the workplace and how to manage them. EARTHnet is a leading network which embraces a core group of people from diverse disciplines and is designed to provide an ethical guide for all those working with nanomaterials including scientists, technicians, caretakers and workers ensuring their safety and health. The purpose of the research team focuses on filling the ethical knowledge gap for safe work practices, policies and procedures with respect to the environment. Through this effort, EARTHnet will gather all relevant data to face the undesirable implications of new technologies, such as nanotechnology. There are plenty of concerns corresponding to the current applications of nanotechnology, as it addresses the increasing difficulty of formulating policy advice due to the current scientific uncertainties. Not all nanomaterials necessarily have a toxic effect; however, the hazardousness of nanoparticles and the exposure risk are emerging issues and require guidance to ensure safe working conditions. Experts dealing with juridical aspects of research including health, safety and ethical aspects should apply their fund of knowledge to describe the emerging legal issues. Such expert counsel should collaborate with people from different branches of academia who have the ability to contribute through their interdisciplinary studies, training and professional activities. Universities, research institutions, organisations, and industry stakeholders from fields such as Engineering, Medicine, Biology, Physics, Chemistry, Law and Bioethics are invited and encouraged to collaborate with EARTHnet. To meet these challenges, integrated and cost-effective strategies should be developed and established in order to (a) mitigate the potential risk upon workers’ exposure to materials (e.g. engineered nanoparticles) employed in the operative conditions, (b) prevent problems before they occur or respond swiftly and effectively when they occur, (c) evaluate methods of measuring particles within all stages of production and processes, and finally (d) provide the appropriate guidelines engaging both scientific and legal functions for an ethically-based healthy working environment. Participants who have already developed a strong occupational safety and health outline could be used as role models for others and enhance their relations with industry and society. The major objective of this network is to explore the ethical issues arising from the impact of nanotechnology on the health and wellbeing of all those working (or getting involved) in occupational sectors. The effects of the implementation of new technologies and sciences are largely unknown to both the general public and policy makers but well known to the scientific community. Thus, there is a need to develop innovative solutions to anticipate and answer future concerns. 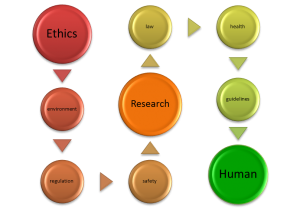 In this context, it is necessary to bridge the gap that exists between science and society by establishing a framework of cooperation and free-flowing communication among many different social actors, defining new research paths, developing new ethical standards, expressing hidden social needs and concerns to be potentially matched in the field of occupational safety and health.